Does Google Consider All SEO to be Black Hat? I sat in an SEO event the other day. It was a good event, and while I agreed with a lot of what the presenter was saying, I had some problems with lots of it. Long story short is that it was too simplified and therefore missed a lot of the nuances of good SEO. Over time, I’ve come to believe that SEO is 75% “science” and 25% “art”. It’s why even well trained SEOs can get different results. Some is research and technique, some is instinct. I think the speaker was trying to help people avoid bad SEO, and I appreciate that, but in over-simplifying, I think he was getting rid of the good with the bad. It got me thinking about a lot, but one of the things that I wanted to talk about, was the topic of this article. Does Google consider all SEO to be bad or black hat, and then basically, what’s the difference between “good” (if there is anything good about it) and “bad” SEO. First of all, what is “Black Hat” SEO? Remember those old Cowboy shows? How could you tell the good cowboys from the bad ones? It was simple… the bad ones always wore black hats. Get it? 😉 Hence, anyone using tactics for SEO that would carry penalties, or that are geared to cheat the system, have garnered the term Black Hat SEO. I like to think that Bryan Cranston’s “Heisenberg” character from the show Breaking Bad would be the modern version of this. Whenever Walter White put on his worse persona, Heisenberg, he would put on his black hat. Made it really obvious when he was going to do something really bad. Anyway, back to the discussion. Black Hat SEO techniques are any of the many practices that would increase or seek to increase a pages rank in the search engines through means which violate the search engine’s terms of service. Black Hat SEO is most commonly defined as a disapproved practice that increases a page’s ranking in a search engine result page (SERP). The reason that many have done these practices before, is that they typically have been very effective. Over time though, Google and other search engines have gotten much more effective at discovering these spammy techniques, and Black Hat SEO can carry very severe penalties, including having your site blacklisted or deindexed. And even though JC Penney claimed that they had no idea that these tactics were being used, it fell on them to have done the research on the company and what they were doing. You hire them… you get penalized if they do the wrong thing. Ouch! How do I avoid Black Hat SEO? 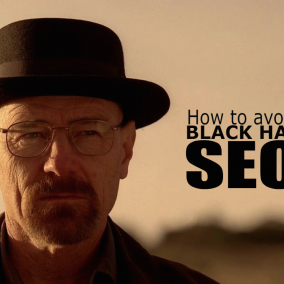 With all the possible risks, you’ll want to make sure that you’re not accidentally doing Black Hat SEO. A great way to think about it is to ask yourself if the work that you’re doing is adding value to the site visitor or are you just doing it for search engines to see? If no value is added to the user, then it’s highly likely to be black hat. If I’m already working with an SEO agency, how can I tell if they’re doing good SEO or black hat SEO? Good question. When you start with an SEO company, they should outline what they do on a monthly basis. If any of those are in question, especially compared to the list that’s above, ask them to clarify what they’re doing and why. Any agency that can’t justify what they’re doing, shouldn’t be touching your website, or creating content for you. AND… just answering “because it works” doesn’t mean it will continue to, or that Google won’t penalize your site for it. Do your homework. If it can hurt your business, you’re the ultimate gatekeeper for what happens. Sum up: Should I be doing SEO? Most businesses would benefit from it. Depending on where you end up ranking for your keywords, you could benefit a lot. So what’s the answer? Does Google Consider all SEO to be Black Hat? No. Matt Cutts, the head of Google’s web spam team said outright, “We don’t consider SEO to be spam,” and added that SEO is “a valid way to help people find what they’re looking for via search engines.” In other words, it’s not black hat when done well. Of course there are all the different things that you need to be avoiding, as we listed above, but SEO that’s done within the guidelines will help your business stay competitive online. If you’re not having SEO done for your website, what kind of signals are the search engines picking up? Are they the right ones? If you’re looking for how to do the “good” version of search engine optimization and need help with your organic SEO, get in touch with us to set up a consultation. We’d love to help you get on the right track.